Today I am going to show you how you can add a really awesome and cool looking Contact form in a page of your blogger blog. This contact form looks really elegant and is very eye-catching. This contact form inspired from Bloggertut works on CSS and has a very rich feel in it. You can make your Contact page more awesome by adding this widget to one of your blog's pages. A live working demo of this widget can be seen by clicking the below button. After seeing the demo if you wish to add this contact form in your blog then follow the steps below. First of all add a Contact form widget to your blog. To do so go to my post Official Contact Form Widget released for Blogger. Do not worry about that the widget will be visible everywhere on the blog and our motive is to show contact us form only on a particular page. We will fix it in the second step. Once you have added the Contact form widget go to Blog Title → Template → Edit HTML. Now add the below given CSS code just above ]]></b:skin> . First of all we need to create a new page and to do this firstly go to Blog Title → Pages → New Page → Blank Page. Page editor will open, now click on HTML tab and paste the below given code in it. After adding the above code, publish the page. You are done now. 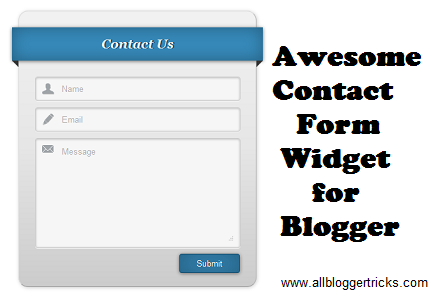 Now you and your visitors can see this awesome and cool contact form widget in your blog. So nice widget. Thanks for sharing. so good , neat and clean man. the coolest contact form i have seen on other sites. Simple and minimal. Looks awesome. Thanks for the blogr template custom widget tutorial. This is really fabulous and nice widget. Even every blogger should add this. I love the idea of this contact form, but I'm wondering, if someone leaves a message in this form, how will I receive that message exactly? Hope I get a reply soon, thanks! Sorry, just read your other post on "Official Contact Form Widget released for Blogger" so you can ignore the question in my previous comment. I will be trying this trick, thanks again! Very Very nice. Its working is awesome really.Thank you so much sir. I'm using it here "http://www.basics2eng.com/p/projects.html"
But how to add my email on submit button where send this message. Hey, just added it and everything looks fine, just the "send" button doesn't work - when I click it, nothing happens. Any way to fix that? Hey, I have a small question. It may seem silly but i really need to know coz I'm nube in this. When anyone will fill this form and submit, where will this information go? Will we get the email on our blogger registered email? Please let me know, I really need help ASAP. I used it on my blog, thanks!